One, moving the coils becomes tedious. If the lowermost coil has to be accessed, the coils piled on top of it will have to be moved first. This increases the time and effort used to do this, making the process labor-intensive. Secondly, the coils stored in this fashion are prone to damage. The weight of the coils piled on top of another coil will cause the bottom coil to get damaged. Furthermore, because of the hooks and lifting systems typically used, this system is more prone to damaging the coils. This can lead to severe losses not to mention the loss of credibility caused by delivering such products. Although this method poses several problems, it has been used for want of a better storage system. SPS Ideal Solutions is a forerunner in this industry. They have been pioneering change and developing creative and practical designs aimed at improving operations. To counter the problems mentioned above, they have developed steel cradle pallets to handle rolls and coiled materials. The purpose of the cradle designs is to improve handling of coiled materials.The design allows the entire rack including the coil stored in it, to be moved with a fork truck. The coil can then be moved anywhere with little chance of being damaged. The time and effort taken to perform these activities is also greatly reduced. 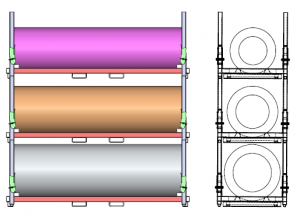 Hence, this well-designed product aims to solve all the problems related to traditional coil handling and storage systems. 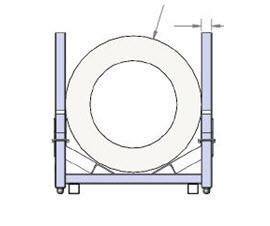 A cradle design is incorporated into a pallet rack when a coil is stored/ placed on its wound surface. This is practiced only when the coil material is extremely durable and the coil can withstand the pressure exerted by its own weight. Keeping the above points in mind, SPS ensures that the surface of the welded assembly of the rack, which is in contact with the coil features smooth transitions. This keeps the rack surface from damaging the coil. At SPS, different types of cradle designs are available to accommodate various roll types and coil materials. 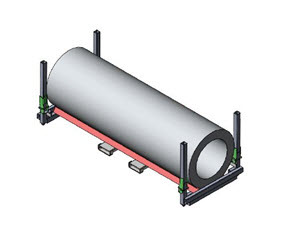 The roll pallet rack has been designed with rails supporting the roll. 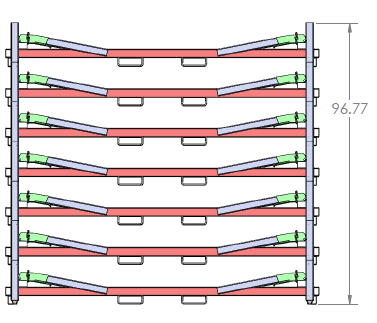 This design helps in reducing the overall weight of the rack, which provides benefits during shipping and storage. The design allows the coils to be picked up from under the coil width. 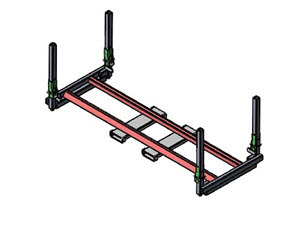 The racks are integrated with features that allow it to be picked up using material handling machines. 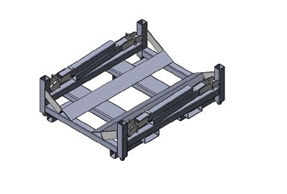 The rail design of the pallet helps in reduction of weight. This is extremely helpful when transporting the racks using trailers where there is a weight restriction for the items being transported. Manufactured entirely with steel, this cradle roll pallet is extremely durable. The full contact surface of the cradle is made of rubber and supports the roll entirely. This helps in reducing the PSI to the coil surface. The upper sections of the corners are removable and can be stored on the flat edges of the deck, making the roll pallet rack extremely compact. Corner posts of a cradle rack can be designed and installed in different ways depending on the product and storage system. SPS will guide you in choosing the corner post most suited to your application requirements. 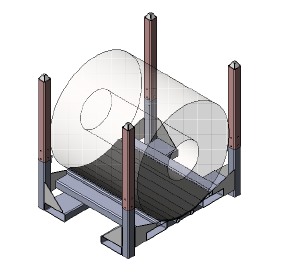 In the cradle design, corner posts can be incorporated to allow the cradles to be stacked on top of one another. By having corner posts that allow for stacking, warehouse space can be maximized to save height. In addition, the corner posts are attached to the base frame. With incorporation of the collared hinge fold feature, easy and safe operation is assured. 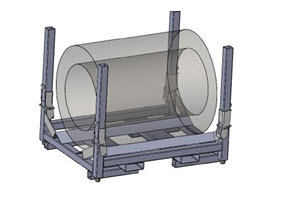 Independent corners have been designed, which can be collapsed and stored on the deck area of the cradle frame when not in use. 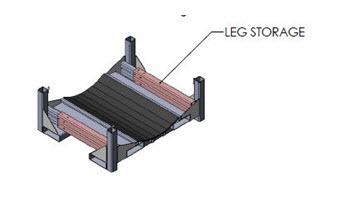 Overall Construction – The body of the cradle pallet can be constructed using stainless steel or aluminum. Both these materials have their merits and drawbacks. They are chosen according to the materials of the coil to be stored. Steel – Steel is the more affordable option. It also provides strength to the entire structure. Aluminum – Aluminum is strong as well but it is also lightweight. Since it is more expensive than steel, it is chosen only when the weight of the rack is critical to operations. Surface Finishes – Surface finishes are applied to cradle pallet racks to provide additional protection. In order to safeguard the coiled (rolled) material, a specialized coating finish is applied on the cradle area. Surface Treatments – Specialized materials are used to keep the coil from sliding. These non-slip surface treatments such as polypropylene ensure safer storage and transit of coils and rolls. Damage Control – A major concern at SPS Ideal Solutions is to keep sharp edges of a rack from damaging the coil or rack. Impact from sharp edges is prevented by utilizing a rolled edge or break line in the forming of the cradle. The Rolled Edge design ensures safe and damage-free operation. The Tab Stack Pallet is a second offering provided by SPS Ideal Solutions in the Cradle Pallet category. 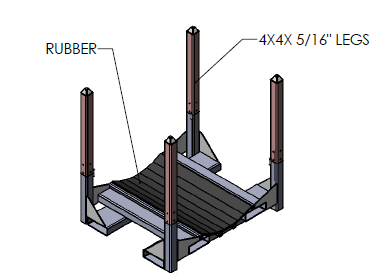 The pallet is designed to handle large sized heavy coils, which cannot be stacked on top of one another.